Automation and networking technology continue to play a vital role in the manufacturing industry, especially mechanical and plant engineering. Along with enabling greater energy efficiency, flexible production capabilities, and digital manufacturing, the Internet of Things is one of the guiding trends shaping the future of automation. This includes the connectivity of physical and smart devices, buildings, and other devices and locations embedded with electronics, software, sensors, actuators, and networks. These “Smart Factories” feature connections that enable devices and locations within facilities to collect and exchange data at unprecedented rates of speed. With fully automated and networked processes, Smart Factories are capable of realizing greater productivity, and as a result, can offer customers improved manufacturing efficiency. All sectors of manufacturing are relying on increased automation to remain competitive on regional and global levels. Lapp Group is playing a critical role in futureproofing automation capabilities by providing an array of data transmission products that are designed not just for today, but for ever-evolving communications needs. Moving forward, cabling and connection systems within manufacturing applications will need to transmit greater amounts of data. FIELDBUS systems have been around for a long time and are reliable solutions for interconnections between devices. The most effective and dominant communication protocol is ETHERNET, which is well established for its information technology applications. The challenge for industrial data network cables lies in providing reliably high data rates within harsh and challenging industrial environments, such as those where the cables are repeatedly bent and flexed in cable tracks, or exposed to corrosive materials and fluids, and high temperatures. Lapp Group meets this challenge head-on by providing our customers with a wide range of products and complete solutions for factory, building, process, and mobile automation. We do so as a single source known for high quality, durability, greater product availability, and unrivaled customer service. 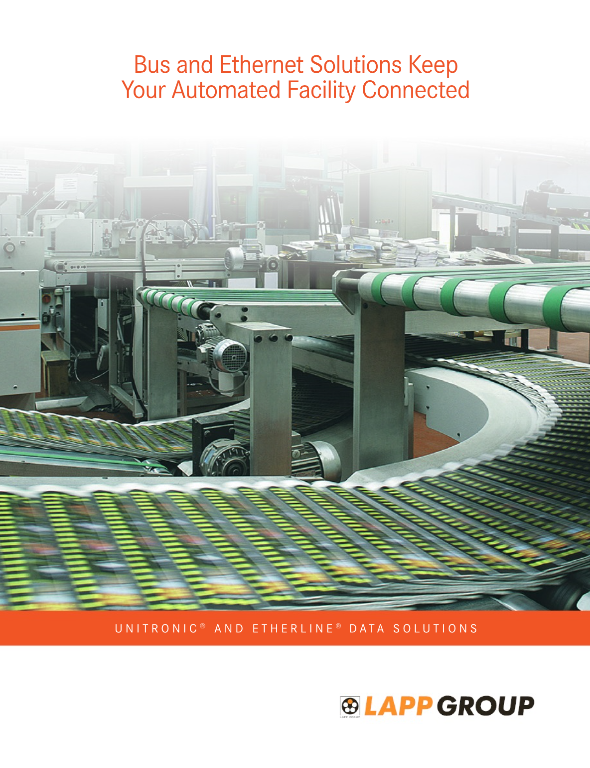 Our solutions include complete cabling and connection systems for integrated networking at the sensor/actuator and control levels, right through to inventory management systems. Industrial Ethernet cables, and connectivity components, are designed to provide reliable network communications. If you have any questions, our team of experts will be glad to work with you in finding the best product for your application needs.